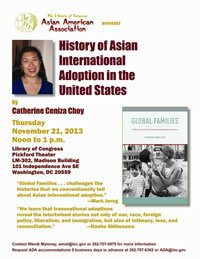 who recently published the book History of Asian American Adoption in the United States. Thursday November 21, 2013 from noon to 1:00 PM. Cooking classes will resume on a monthly basis beginning in October. Chinese cooking and culture in teaching FCC families how to make delicious Chinese dishes. Classes begin promptly at 2 p.m. The cost will be $15/family (with up to two children). Space in the class is limited and is available on a first-come, first-served basis until the class is full. To register for a class, email FCC member Meg Maher at megeckie@gmail.com. These classes depend upon FCC families to volunteer to host. Contact Meg if you would be willing to host a future cooking class in your home. The group will meet once a month to discuss selected readings related to adoption, Chinese culture/history, and general parenting issues. Books will alternate between fiction and non-fiction and will be chosen by the group several months in advance. Feel free to participate on a regular basis or when a specific book or theme appeals to you. In addition to book discussions, the group will occasionally discuss films and attend cultural events. 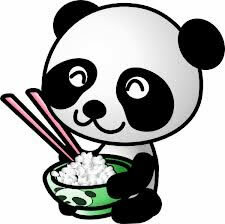 FCC members at all stages of parenting and waiting are warmly invited to join the group. Our book group selections are listed below. We'll be reading two books this month, but both should be fairly quick reads. All FCC Capital Area members are warmly invited to join the group at any time. If you plan on attending the first gathering or if you have questions, please contact Lucia Saperstein at luciamorgan@yahoo.com. Lucia will provide you with all of the details in terms of the location and time of the book group meetings. US ARTS Center is offering art enrichment programs for children aged 4 to high school students. All of our classes are in small sizes to ensure teaching quality and individual attention. This art education center has a good art teaching curriculum and management system running successfully for over 12 years in Southern California and we opened a new branch recently in Northern VA.
USArtsChantilly@gmail.com reserve a space for your child. The Sackler Gallery and Freer Gallery - Smithsonian National Museum of Asian Art.